The pearling fleet leaves Kushimoto, 1953. 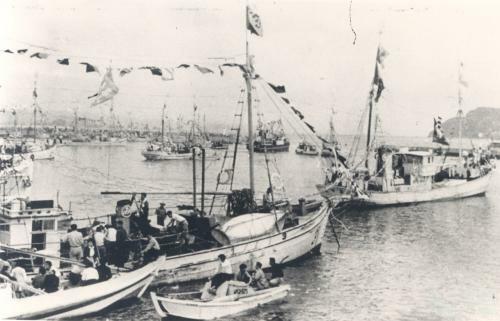 The first post-war pearling fleet was farewelled from Kushimoto in 1953. For the people of Kushimoto, sending this fleet to Australia seemed like the resumption of an old tradition. However, the entry of the Japanese fleet into what Australia now claimed as sovereign territory followed protracted negotiations, because Australia sought to assert the new international doctrine of sovereignty over its ‘continental shelf’. The Japanese government eventually acknowledged Australia’s territorial claim and agreed to catch quotas and size limitations.